Let me share with you an experience I had last Thursday. I went to grocery for lamb meat that I was planing for that evening. As I pushed the shopping cart toward the meat section, I noticed an old lady standing in front of the meat cold rack staring at the meat for a long long time. After waiting behind her a while my patience was running out. So I slid beside her and said ‘ can’t make up your mind?’ She smiled and backed up a little bit. I engaged her in conversation and asked about how she would cook lamb meat. So we talked and found out that she lives in the east side of town – a poor section of the city. I got my lamb leg and walked away. At a distance I looked back again and she was still there. All of a sudden it dawned on me that perhaps she wanted to buy some meat but didn’t have the money to buy. 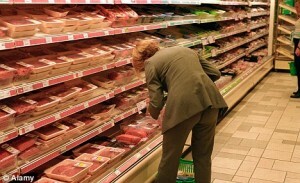 Here she was just staring at the mouth watering meat when cooked. So I doubled back dragging the grocery cart and drew up beside her. ‘May I buy you something?” I offered. Her eyes lighted up and was speechless for a moment. “How would you do that sir?” . I took a piece of meat she was starring at and handed it to her. The price tag was $ 9.00. I reached for my wallet and pulled out $9.00 cash and gave it to her. ” Please enjoy and have a good holy week celebration” those words that came out of my mouth was no longer a casual remark that I and people normally do – it was a sincere outflow of my heart. She thank me, still stunned with a surprised look on her face. I smiled back as I walked away. I came home feeling happier than her.